Pinning their high hopes on the successful operation of one political prisoner today, rights group SELDA said that “best prescription” the Aquino government can give is to free political prisoners who suffer from serious ailments. Ramon Argente, 53, a peasant organizer from Bicol, is scheduled for a triple bypass surgery today at the Philippine Heart Center. As of this writing, his family and SELDA are still asking for help to complete the huge amount needed for operation expenses. “It is with extreme disappointment that the family is raising the needed amount whereas, by all means, these should be shouldered by the state. The amount of money cannot even be compared to what the government is spending to take care of Gloria Macapagal-Arroyo and multi-billion scammer Janet Lim-Napoles. We pay for every single centavo to save lives of plunderers and wrongdoers, while we let those wrongly accused die from crimes they did not even commit. This is injustice at the very core,” Clamor said. Argente is one of the 48 ailing political prisoners that need proper and immediate medical attention, according to SELDA. “By deliberately denying proper medical treatment on ailing political detainees, the Aquino government is like putting them on death row,” said Clamor. Argente, along with union organizers Randy Vegas and Raul Camposano, were charged with several and varying counts of murder, theft and frustrated murder before the Regional Trial Court Branch 64 in Labo, Camarines Norte. A total of 32 individuals were included in the said charges, where four have been arrested including Vegas, Camposano and Argente. “Argente, among other political prisoners, has not been even proven guilty of the trumped-up charges filed against them. His rights, along with his co-accused have been violated since day one of arrest. They were arrested without warrant, held incommunicado for days after their arrest, and denied of counsel – all of which are violations to their right to due process, liberty and security,” Clamor said. SELDA previously announced the death of a political prisoner, Alison Alcantara, who died last month due to diabetes complications. “We are enraged at the double standard treatment of inmates under the Aquino administration. Political prisoners who are victims of false and trumped-up charges are treated like dirt in prison facilities. While, according to them, those who skimmed government funds with the collaborations of certain high government officials are given with the most elaborate security, high food allowances, air-conditioned rooms, regular monitoring of medical status, easy communication with the outside world, liberal visiting procedures, among other privileges. Surely, this is how the government treats one of its own – in a crook’s prison haven, while political prisoners rot in like hell prison holes.” SELDA national coordinator Jigs Clamor said. Clamor added that by continuously denying them to be treated immediately and properly given medical care, the government is endangering more lives of political prisoners. According to SELDA, ailing political prisoners are more vulnerable inside prison. MANILA, Philippines — During the height of severe flooding brought by the tropical storm “Maring”-enhanced southwest monsoon, schools, corporations and ordinary citizens who spared the worst of the calamity responded swiftly to the needs of those who were affected, mobilizing in government offices, covered courts, even private homes to donate and repack relief goods for deployment. They pooled their earnings from the handicrafts they make and donated these through the human rights organization Karapatan, which, with allied organizations like Selda or the Samahan ng Ex-Detainees Laban sa Detensyon at Aresto, and Hustisya or Victims United for Justice, regularly visits and assists them. The donation of the political prisoners went to a community in Manila’s Sampaloc district that had been hard-hit by the floods. The detainees spend much of their days crafting everything from replica jeepneys, tissue holders and pen holders from folded strips of telephone directory pages; to greeting cards with pressed dried flowers; taking sacks apart and weaving these into hammocks. They concede using rope to make the hammocks would be a lot easier except that this is not allowed inside the detention center. Their handicrafts sell from P50 to P800 each, the earnings supplementing their meager food rations, buying medicines and personal needs and, yes, supporting their families. And while they did need the money, this time, other people just needed it more. Alan Jazmines, consultant of the National Democratic Front and, according to the government a ranking officer of the Communist Party of the Philippines, said the disaster was so widespread that it was shocking. Jazmines, who has been detained since February 14, 2011, said he considered himself lucky to have family, friends, and former classmates who send money every now and then to support his needs in jail. So why not share with the flood victims what others have shared with him? This was the same sentiment that prompted his fellow “poldets” — six of them toa cell — to donate to the flood victims. Voltaire Guray, a peasant organizer, said it was important to take action and not leave the relief efforts solely in the hands of the government. Charity did seem to agree with him, as he seemed to be in good spirits even if the rains cancelled a hearing of his case scheduled for August 20. His last hearing had been in March. The 27-year-old has been detained for a year and eight months on charges of illegal possession of explosives and ammunition, which he denies. He spends his days doing human rights-themed paintings, aside from fashioning craft works from telephone directory pages. Through their products, he hopes people on the “outside” become conscious that there are political prisoners in the country. He wishes, however, that the wheels of justice would turn more swiftly for him and his fellow detainees, who he says are innocent of the crimes they are accused of committing, except for fighting for the rights of others. Jazmines said it was ironic that the Aquino government does not recognize the existence of political prisoners, despite previous administrations since the time of then President Fidel Ramos doing the opposite. In fact, he said former President Gloria Macapagal-Arroyo even promised to look into the cases of 300 political prisoners, who included 32 women, minors, elderly, and the sick, who were set to be released in 2001. However, four of them are still in Camp Bagong Diwa; a fifth died in prison. Detained thrice — twice during Martial Law for subversion, and currently for rebellion and 13 counts of murder — Jazmines, a former Asian Institute of Management professor and steel industry manager, says he and his fellow political detainees are being held “hostage to the peace talks” between communist rebels and the government, their release dependent on whether stalled negotiations move forward again. But while jail may have robbed them of their physical freedom, it has not doused their desire to help their fellowmen. 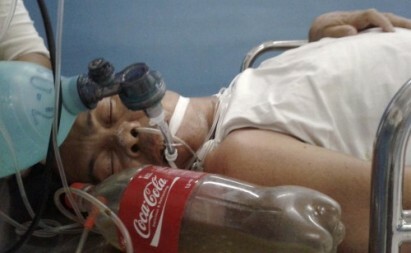 MANILA, Philippines — Friends of cultural worker and former UP Collegian editor Ericson Acosta, who was temporarily released from a jail in Samar for treatment at the National Kidney and Transplant Institute in Quezon City, are asking support to thwart what they said was a court order to handcuff him to his hospital bed. Acosta, for his part, has written Justice Secretary Leila de Lima seeking a dialogue on why a resolution to review his case that was filed by his lawyers with her department on September 2011 has still not been acted on. The Free Ericson Acosta Campaign said 10 armed personnel of the Bureau of Jail Management and Penology led by Colonel Joseph Vela went to the NKTI Monday to inform Acosta that they would return at 11 a.m. Tuesday to implement the court order to cuff him to his bed. Vela also said that visitors and Acosta’s companions will no longer be allowed to use cellular phones inside his room. The lone jail guard from Samar who had been guarding Acosta since he arrived in Metro Manila on Friday, is returning to the province, the FEAC said. “It is cruel, it is degrading and it is even inhuman,” and “proof that the poor and powerless are treated different from the rich and influential,” citing former President Gloria Macapagal-Arroyo, former Commission on Elections chairman Benjamin Abalos Sr. and former Philippine Charity Sweepstakes Office executive Manuel Morato Jr., “who have used their arguably contrived medical condition to whoop it up while facing far greater and well-ground charges” than those aghainst Acosta, the NUPL said in a statement. Acosta, 40, was arrested by the military in San Jorge, Samar, where his supporters say he was doing volunteer work among peasant, on February 13, 2011. His family and supporters are trying to raise funds for his hospitalization, including surgery needed to remove kidney stones. Public Attorney’s Office head Persida Rueda-Acosta helped convince the Samar court where Acosta is charged to order his temporary release for treatment after he was examined by a PAO medical consultant. Justice Secretary Leila de Lima on Tuesday ordered the “immediate disposition” of a petition for review filed by detained poet-activist Ericson Acosta, who is currently confined at the National Kidney and Transplant Institute (NKTI) in Quezon City. Acosta had sought a meeting with De Lima, complaining in a letter that he was arrested 23 months ago in Samar without a warrant and was tortured, while his petition for a review of his case has been pending at the justice department for several months. De Lima, in a response texted to the Philippine Daily Inquirer, said she would not be able to meet with Acosta. “I am not sure if I can accommodate (his) request for a meeting,” she said in a text message. 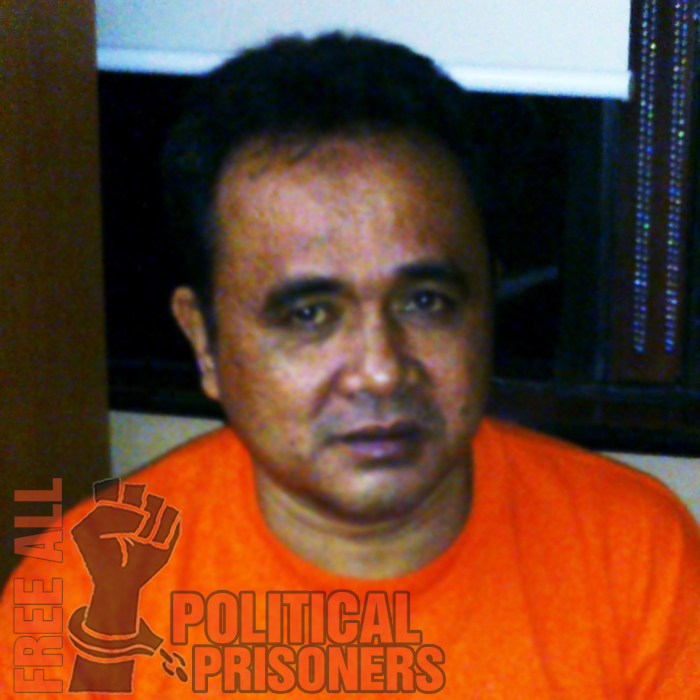 Acosta, 40, was arrested by the military in San Jorge, Samar, on suspicion of membership in the rebel New People’s Army. He was charged with illegal possession of explosives. Acosta claimed he only carried a laptop and was doing volunteer research work for a local peasant group. He has been detained at the Calbayog subprovincial jail. “It is cruel, it is degrading and it is even inhuman. This is another clear and shameless proof that the poor and powerless are treated differently from the rich and influential,” NUPL secretary general Edre Olalia said in a text message sent to the Inquirer. The NUPL said high-profile detainees such as former President Gloria Macapagal-Arroyo, former elections Chief Benjamin Abalos Sr. and Philippine Charity and Sweepstakes Office ex-Chairman Manuel Morato, among others were treated leniently when they were hospitalized despite the fact that the charges they were facing were “far greater, serious and well-grounded” compared to Acosta. According to the Free Ericson Acosta Coalition, a multisectoral group supporting the detainee, 10 fully armed personnel from the Bureau of Jail Management and Penology (BJMP) were stationed at Acosta’s hospital room not only to guard him but to see to it that he is handcuffed to his bed at all times. The BJMP has also banned Acosta’s visitors, including family members and paralegal consultants, from using their mobile phones whenever they are visiting him. Acosta’s supporters said there was no need for overkill security measures as his visitors were mostly family members, artists and cultural workers. 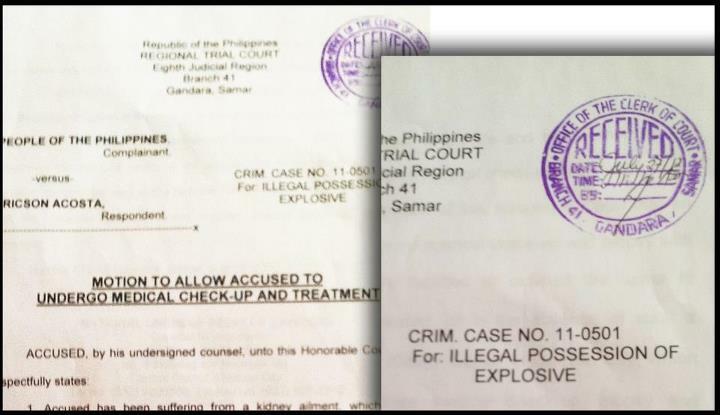 A Samar court granted Acosta’s motion for a medical checkup last week after a medical team from the Public Attorney’s Office confirmed he was suffering from nephritis, a condition characterized by blood in the urine (hematuria), lower back pains, high fever and painful urination (dysuria). I am Isaias Acosta, father of detained artist and activist Ericson Acosta. I am writing this while I recuperate from a minor surgery pending further medical tests. Prior to my operation, I was all set for another visit to the sub-provincial jail in Calbayog City, Samar where my son has been detained for more than a year now. I am now 79 years old, not in the best of health but would not pass up a chance to visit Ericson if I could help it. My wife, Liwayway, is turning 80 this year. She would have gone to Calbayog without me but she can hardly walk without support. PLEASE SHARE: Motion for Ericson Acosta to under medical check-up and treatment received by the Regional Trial Court Branch 41 in Gandara, Samar, on July 27, 2012. Judge assigned to the case recently retired, leaving this urgent motion to wait until a new judge is installed. We are both physically suffering due to our respective conditions but nothing compares to the torment of knowing that our son continues to be unjustly imprisoned. My recent medical setback ironically and agonizingly emphasizes the reason behind our intended urgent visit. Lately, Ericson had been complaining of a nagging pain in his abdomen and lower back. The pain, he says, intensifies whenever he urinates. Now he has also noticed spots of blood in his urine. My cousin, Ericson’s uncle, displayed similar symptoms before he succumbed to prostate cancer. Ericson rarely complains when he is sick. Even when he was arrested last year, his first words to me were, “Daddy, huwag kayo’ng mag-alala.” He always tells his mother not to fuss over him. Ganyan si Ericson. Hindi niya iniinda hangga’t kaya niya. Once when he was still in grade school, he waited until a “stomach ache” had become too unbearable before he finally told us to take him to the hospital. It turned out he immediately needed to undergo an appendectomy. The doctor said we got there in the nick of time. Ericson’s last check-up two years ago revealed a renal function abnormality and a possible prostate affliction. So as soon as we received word that he is in pain, we arranged for a visit and asked our lawyers to immediately file a motion before the court seeking urgent medical attention for my son. We had to skip the visit because of my condition. But after we filed the motion, we were told that the judge in charge of his case had just retired. How long would it take until a new judge is installed? It is as if our frustration with the slow resolution of Ericson’s case is not enough. We are once again left bereft of immediate legal options. I write this letter of appeal to the jail warden, to the Department of Justice, to Secretary Leila de Lima, and to all other concerned branches of government. I am an old man with no shortage of illnesses as expected of anyone my age, but I would gladly forfeit any trip to the doctor if it could only be traded for much-needed medical treatment for my son. His mother and I fear that his latest hunger strike has further worsened his condition. Ericson must get the medical attention he needs. I am writing this letter a few days after former President Gloria Macapagal-Arroyo was released on a million-peso bail. I cannot but be distressed by the continuing prejudice of our justice system against my son and other political prisoners like him. Arroyo was placed under hospital arrest in consideration of her illness. Si Arroyo, sa kabila ng kanyang mga kasalanan sa taumbayan, ay pinayagang manatili sa de-aircon na ospital, regular na inaasikaso ng mga doktor at nars gamit ang buwis ng mamamayan. Ngayon siya’y pinalaya pa. Si Ericson at iba pang tulad niya na ang tanging kasalanan ay magsakripisyo para sa maliliit na tao, nasa kawawang kalagayan at hindi kinikilala ang mga karapatan. No, we do not seek preferential treatment like Arroyo. What we demand is that Ericson and all other political prisoners – who are ailing precisely because of dismal prison conditions – also be accorded the right to medical attention as necessary. We appeal to all freedom-loving citizens and human rights advocates to once again help us in our latest plea for Ericson. 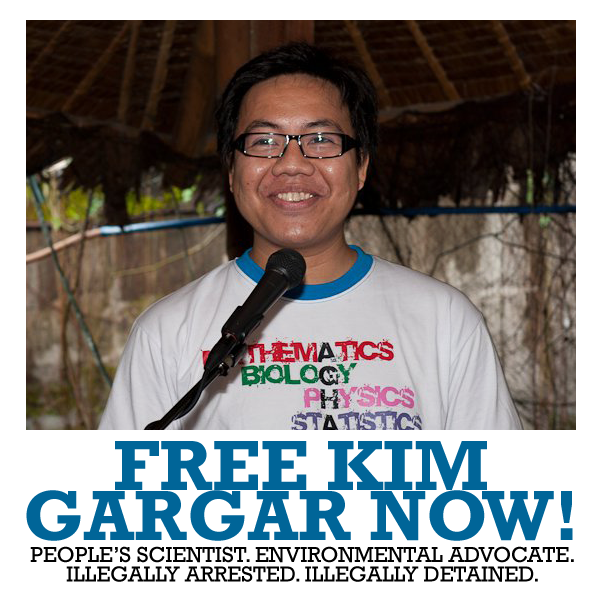 During these disconcerting times, we shall continue to fight for Ericson’s release from detention. We add our voices to all others whose sons and daughters are unjustly imprisoned – free all political prisoners.